Discussion in 'Site Announcements' started by sothis, Jul 12, 2018. There's a fairly hidden feature that exists on table view, on your personal list pages, that allows you to increment your episode count by +1 at a time for anything marked "watching". Table view isn't the most attractive so not a lot of people use it (note: we're working on an improved design/flow for it). But now, you can do the same thing on grid view pages anywhere! 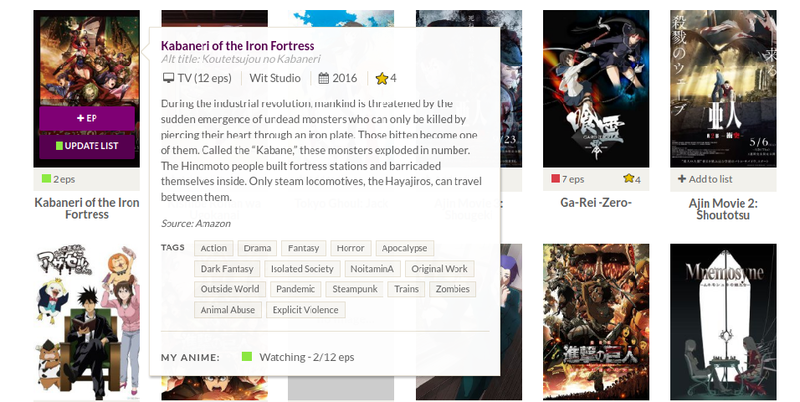 Anywhere** you can see grid view (browse by tag, season charts, your personal anime list, etc), this +ep button will now appear on hover, if the status is set to "watching", "stalled", or "dropped". Once you reach the maximum episodes available, the +ep button will vanish. Clicking "add to list" will bring up the modal as always (which lets you change status, episodes, add a rating, etc). The +ep button is a single-click way to increase the eps by 1. **It currently doesn't work on the challenge page only, but we're working on how to fix that. DinoMaarten, Kukkucarrotcake, Macke and 10 others like this. Thank you so much for this! Thanks for all the hard work! StarsMine, GlennMagusHarvey, interregnum and 2 others like this. Love it, great for updating seasonal anime binge! I really like this addition. Thank you! How do you change to table view? Thanks! I tried that and it worked!